“Khensur Jampa Tegchok Rinpoche had the idea for this book in his mind for many years,” wrote Ven. Thubten Chodron, editor of the forthcoming book from Wisdom Publications Insight into Emptiness. Based on talks on emptiness given by Khensur Rinpoche and translated by Ven. Steve Carlier, Insight into Emptiness presents an expansive collection of important points elucidating emptiness based on many sources from the Gelug tradition. The simile of the cloud is connected to phenomena of the future and illus­trates their lack of existence from their own side. Rain cannot fall from a completely clear sky. For rain showers to happen, first clouds must gather in the sky. Then the rain falls, and that has the potential to make crops grow, trees become full, and fruit ripen. Nevertheless, the sky itself has been clear all along. The clouds are adventitious; they arise dependent on causes and conditions. In the same way, the nature of the mind is clear light in that it totally lacks self-existence. Yet within the clear light and empty nature of the mind, the clouds of afflictions and their latencies gather. They motivate us to engage in many actions, which produce the various ripening results that we experience in the future. Like the simile of a cloud, this is a dependently arising process: ignorance, afflictions, karmas, happy, and miserable results all occur through dependence. Being dependent, they do not exist in the way they appear. They gather and disperse just like clouds, yet seem real while they are present. All of these causes and results exist by being merely imputed by term and concept. If they were inherently existent, causes and their results would exist at the same time. It would be as the Samkhyas believe when they assert arising from self: the results would exist in a non-manifest form in the cause. In that case, the crops, trees, and fruit would have to already exist inside the rainclouds that are their cause, and there would be no need for the rain to produce them. The Tibetan word for future means “that which has not yet come.” If any resultant phenomenon were inherently existent, it would not need to depend on a cause to arise. That is because something that exists inherently already has its own entity. Something that already has its own entity does not need to arise; it already exists and so doesn’t need to be produced. Conventionally existent causes and results do not need to meet, but inherently existent ones would have to meet. If they didn’t meet, how could one produce the other? There would be a time gap between them. But if they met, they would occur at the same time, in which case a sprout would already exist, and it wouldn’t be necessary for a seed to produce it. In general, for a result to arise, its cause must cease. That means that the result comes about through the ceasing of its cause. There are two ways in which a cause gradually transforms into the result. In one way, the cause ceases to be seen. For example, when a huge tree grows from a seed, the seed has disappeared, and we no longer see it. In the second way, there is a continuity of a similar type. For example, when we cook rice, the rice undergoes a transformation by changing constantly, moment by moment. At the end, we still see something that we call “rice,” although it is not the same as the rice before it was cooked. The ceasing of the cause and the arising of the result are simultaneous, yet we know that when we were born our mother did not cease to exist. So when we say the cause ceases when the result arises, it does not mean the cause utterly ceases to exist or the person dies. Rather, it means that it undergoes momentary change in which case the earlier moments in the continuity cease while later moments of that continuity arise. The continu­ity of our mother exists after we were born. Causal dependence – causes producing results and results arising from causes – is one type of dependent arising. This demonstrates that things do not exist from their own side, independent of anything else. It also proves that things do not exist as they appear. This resembles the simile of the cloud: first there is the clear sky, then clouds form in it, the rain falls, and the crops and plants in the earth below are nourished and grow. All along one thing happens depending on another. None of this could take place if things existed from their own side. Khensur Jampa Tegchok Rinpoche studied at Sera Je Monastery in Tibet for 14 years before fleeing his homeland in 1959. 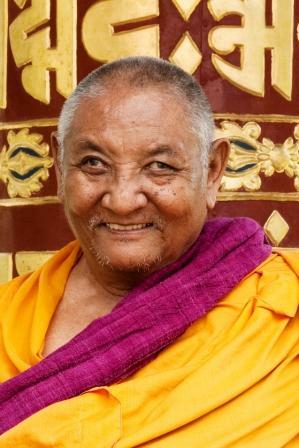 He has taught extensively at Nalanda Monastery in France, Land of Medicine Buddha in California, USA, and in the Masters Program at Istituto Lama Tzong Khapa in Italy. Ven. Thubten Chodron has served as resident teacher at Amitabha Buddhist Centre in Singapore and at Dharma Friendship Foundation in Seattle. She is founder and abbess of Sravasti Abbey, a Buddhist monastery in eastern Washington State, USA. In addition to editing Khensur Jampa Tegchok Rinpoche’s book Transforming Adversity into Joy and Courage, she is the author of Buddhism for Beginners and other Dharma books. There’s more coverage of Inside into Emptiness on fpmt.org/mandala/. Listen to an online audio interview with editor Ven. Thubten Chodron about Khensur Rinpoche, emptiness and the work of editing a book. Also read an interview with Khensur Rinpoche from Mandala July-September 2010.